The photographer on the right got it right. When the play got close he tucked his monopod (with camera and long lens) into the crook of his left arm? Why there? So you can jump up and out of the way if the player runs right at you. Then he grabbed his camera with a wider angle lens to get the shot of the approaching receiver. When I did high school football games for a small town newspapers, I used two cameras too, just like the guy on the right. My camera with a long lens was on a monopod, and my camera with a wide angle lens was hanging off my right shoulder, ready to grab a shot at a moment’s notice if the play came too close to get with the long lens. Did I ever miss a shot? Sure. But usually it was because I didn’t nail the focus. I did newspaper sports before we had autofocus so you had to manually focus on the approaching player. Predictive autofocus has made this all much easier so photographers get more keepers. But I rarely missed a shot for lack of having the camera up to my face. The minute the offense lined up on the ball, all of us sideline photographers raised our cameras to our faces and they didn’t come down until the play was over or we had to switch cameras. You can get fooled. With receivers racing down both sidelines you can be following the far receiver with a telephoto lens and then the quarterback throws the ball to the receiver right in front of you. That is why your camera with a wide angle lens should be pre-metered and pre-focused on a spot where something might happen right in front of you, like the near corner of the endzone. If the ball ends up close to you, you quickly grab the camera with the wide angle lens and shoot. If there isn’t time to bring the camera up to your face and tweak the focus, you can always shoot from the hip like an old west gun fighter. 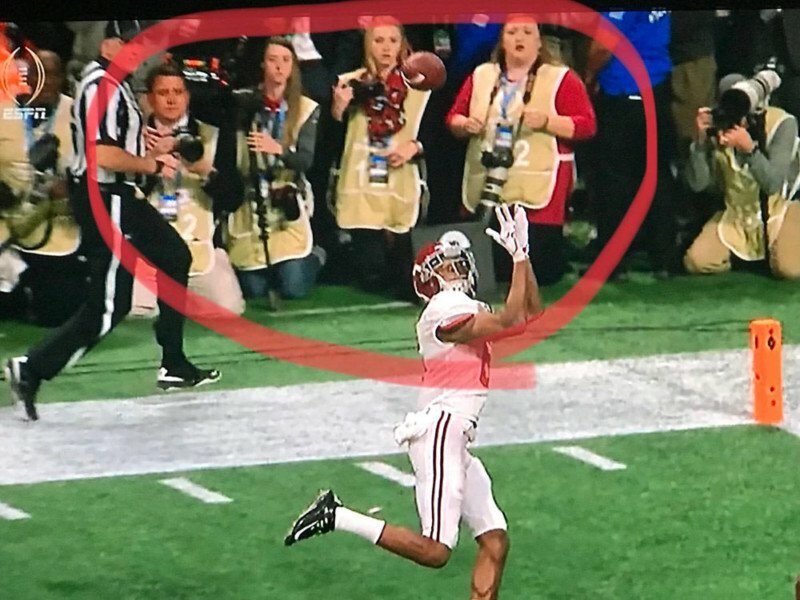 The photographer just to the right of the ref (photo at the top of this article) does not have his camera up to his face but he does have it pointed at the receiver. He might be shooting from the hip so he may have gotten the shot. With a little bit of practice you can learn to point the camera at the receiver without even bring the camera up to your face. 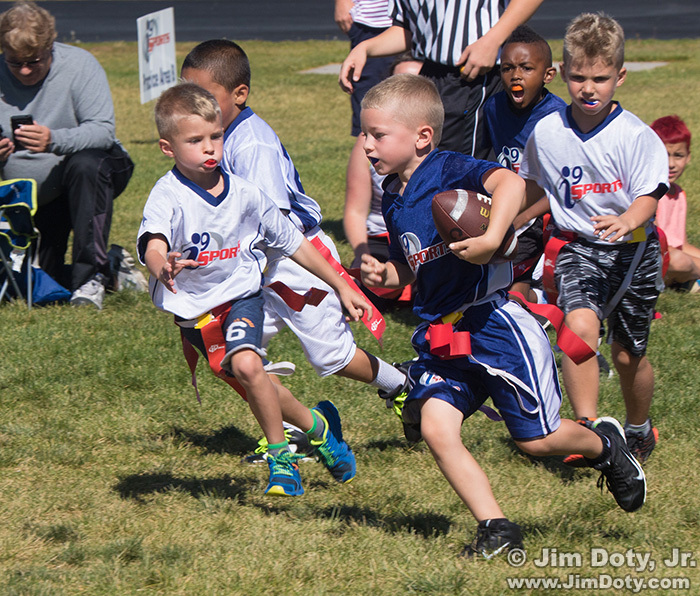 The secret is to hone your skills at little kid’s football games. I learned sports photography back in the days of film when you advanced the film one frame at a time with your thumb. None of the people I shot with along the sidelines had those fancy, expensive motor drives. Even at that you could fire off three to five frames on a long play. 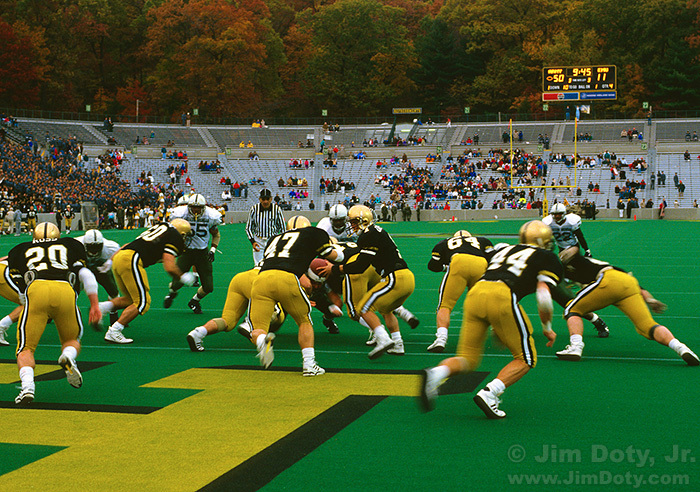 If we were getting close to the end of a 36 exposure roll (around frame 32), we changed film in between plays so we wouldn’t run out of film during the middle of the next play if it happened to be a big one. On most short plays we picked the best moment and got off one shot. But that was then. Now most cameras have some kind of high speed mode built in so you can take 3 to 10 frames per second (depending on the model) without every letting up on the shutter. And you can shoot a ton of photos on a digital memory card before you have to change cards. It is still a good idea to check how close you are to filling up your memory card and change cards between plays when you have still have room for 10-20 more photos on the card. You don’t want to run out of room right in the middle of a great play and miss the shot. So get out there and practice. And if something great happens (especially if the game is on ESPN), for heavens sake (or your editor), put your camera up to your face! This entry was posted in General, Using Equipment by Jim. Bookmark the permalink.